Enjoy fresh, cold draft beer at home by converting an existing refrigerator into a Kegerator. American Sankey "D" system keg coupler that features a stainless steel, a stainless steel handle fork, a tin-nickel alloy plated probe, a short lever handle, a built in pressure relief valve, and check valves for both the gas-in and liquid-out ports. Do I need to keep the CO2 tank inside the refrigerator? CO2 (or mixed) gas cylinders do not have to be kept in the refrigerator. 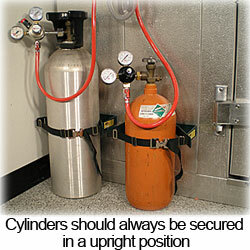 Gas cylinders are often located outside of the refrigerator to allow maximum use of the refrigerator interior space. All that is needed is a small hole in the side or back of the refrigerator for the gas hose to go from the regulator to the keg coupler. The distance between the cylinder and the keg is not important and does not affect performance. 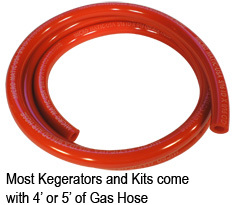 Most kegerators and refrigerator conversion kits come with a 4’-5’ length of 5/16" I.D. 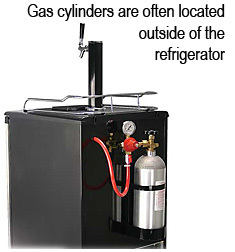 vinyl gas hose as most installations place the gas cylinder in the refrigerator with the beer keg. If you wish to locate your gas cylinder farther away, simply purchase a longer length of 5/16" I.D. vinyl gas hose. But for safety reasons, keep in mind cylinders must always be kept upright, away from sources of heat, and be secured with a chain or strap to prevent it from falling over. Should the gas cylinder be exposed to a source of heat, the gas inside the cylinder will expand resulting in over pressurizing the cylinder. This may cause the pressure relief valve (PRV) on the cylinder to burst, resulting in an incredibly loud boom. The cylinder will be OK, but the thin copper burst disk in the pressure relief valve (PRV) assembly will need to be replaced.